Lycamobile which is Europe's largest MVNO with 20 million customers in the 16 countries, has launched in the US. The Lycamobile website is live and Lycamobile will send you a free SIM for the asking. $39 Unlimited Plan: Unlimited domestic talk and text. Unlimited data (100 MB at 4G speeds). $49 Unlimited Plan: Unlimited domestic talk and text. Unlimited data (250 MB at 4G speeds). Pay As You Go: 4¢/minute, 4¢/text, 6¢/MB, Minimum top-up is $5 good for 90 days. Unused balance rolls over when you top-up. Although the pay as you go plan is advertised on the Lycamobile site, according the Lycamobile telephone support it won't be available for a "few weeks". Lycamobile is giving early adopters a little bonus. Through April 30, 2013, the $49 plan comes with $20 of free international call credit and the $39 Plan comes with a $10 international credit. In Europe, Lycamobile is noted for inexpensive international calling. The US product does pretty well with international calls too. Prices for calls to mobile phones in the five Prepaid Phone News International Market Basket countries are: Canada 1¢; Mexico 4¢; China 2¢; UK 5¢; Philippines 12¢ - Total 23¢/ 5 = 4.6¢ Average. That puts Lycamobile in a tie with Ultra Mobile for the lowest International Market Basket prices. Like Ultra, Lyca offers international direct dialing with no access code required. If you text very much internationally Lycamobile is not such a good deal. International texts are 12¢ each. Several other MVNOs with low international voice rates let you send international texts at no extra charge on pay as you go and for free on unlimited plans including PTel, Ultra. PrepaYd and Total Call. Lycamobile plans include international roaming but the rates seem very high. Making a call from Canada to Canadian or US numbers costs $1.84/minute, texts are 64¢/each. Calling from Mexico to the US or Mexico is $4.60/min and texts are 74¢/each. The good news is that incoming calls and texts are free while roaming in either country. Lycamobile offers auto-pay using a debit or credit card. It's not clear what taxes and fees Lyca charges. The website's FAQ page states that there are no "monthly or hidden charges" but it also says "All charges are inclusive of tax. However, there may be required sales and similar taxes that are required by the state and are charged by the retailer where you purchased your Lycamobile products. There may also be various federal and state fees that Lycamobile must collect or that Lycamobile must pay as part of regulatory requirements that Lycamobile may pass on to its customers." The Lycramobile site doesn't reveal which mobile network operator the service uses. There's no coverage map on the site and the data APN settings don't provide any clues. As for phones, Lyca just says you can use any unlocked GSM phone. I called Lycamobile and was told that they use the T-Mobile network. Enter the required fields, which including your zip code and press the Find Address button. A list of 50 or so addresses will appear. None of them are likely to be yours, so just pick one. Update: you must pick an address that's a PO Box, the address field is only unlocked for PO Boxes. If there are no PO boxes listed in your zip code you are out of luck. Click the Validate the address button. Change the pre-populated address fields to the correct values and press the Submit button. The website said my order succeeded. I didn't get an email confirmation. Hopefully I'll get the SIM. If it launches as advertised, Lycamobile's pay as you go will be a great deal. It has the best rate yet for pay as you go GSM data and a low minimum payment of $5 every 90 days. Lyca's monthly plans are less competitive, particularly if you send many international texts. Ultra Mobile's unlimited plans start at $29 with unlimited international texting and international voice rates that are about the same as Lyca's. And Ultra's $49 plan includes 1 GB of high speed data, four times as much as Lyca. On the other hand Lyca's $39 plan does include 100 MB of high speed data vs none on Ultra. Calls to Lycamobile voicemail are free. They almost always are on unlimited plans. Yes; let's see whether the policy and Terms of Service change when/if they launch Pay-Go. ... no so on pay-go or bucket plans, typically. So it's a bonus if this applies to Lycamobile's pay-go. Something doesn't sound right,looks like INCOMING calls are free almost anywhere in the world, I wonder how they do that. Free incoming is the norm outside of North America. It's called the "caller pays" system. You pay extra to call a mobile number which lets the call be free to the receiving party. It dosn't make sense....My phone has a local Las Vegas number, and whomever calls me pays nothing, so if I am in Europe, you want to tell me that the caller will pays extra without him knowing that I am outside of the U.S.?? I called Lyca and they confirmed that calls to your U.S. number are free to the calling party (except for long distance if applied)and there is no charge for you for incoming calls and SMS. I think, if you travel internationally, this is by far the best deal around. It there's never an extra charge to call US mobile numbers even if the called party is roaming. This is true on any carrier, not just Lycamobile. Dennis, I think what they are trying to say in regard to Intl. roaming, is neither the calling party nor the traveling party is paying for the incoming call (Roaming) with Lycos, and that option is NOT available from any other mobile Co. in the U.S. Yes, it does seem like you are getting something for nothing when someone in the US calls a Lycamobile subscriber who is roaming internationally. But that's typical of International SIMs like Tru which feature free incoming calls and texts in most countries. Lycra has better domestic rates than Tru but much higher rates for making calls/sending texts when roaming. Incoming calls/text always being free is so ingrained in the culture in most countries that any company that tried to charge for them would be avoided as a ripoff. An ideal set up for international travelers would be two phones or a dual SIM phone and a Lyca SIM for a US number with free calls and texts from the US and a local SIM for outgoing calls and texts and incoming local ones. If you don't want to buy a dual-sim phone, you can order a Tru SIM and have a second UK or Australian phone number that works on your Tru sim for $8 in the months you need it (order before you leave, and cancel when you return, if you want). People in the US or the other number's country can just dial a local number to call you. You "may" be charged to receive calls to your US number, but folks can reach you without paying extra. Another ideal setup for international travelers is to buy a data-only sim at the airport or local phone shop when you arrive. The data rates are MUCH lower than you can find before you leave. Put that sim in your unlocked, international data band smartphone, wireless router or tablet, and use a separate, 4-band, unlocked GSM dumbphone for calls. You won't have to charge it every day. Charging on the go overseas can be a challenge. You might want to carry an external battery for charging the smartphone/router/tablet in the middle of the day. Is Lycamobile the only U.S. prepaid carrier that offers international roaming? Certainly, it seems like it is the only U.S. prepaid carrier that offers free incoming calls while roaming in almost any country. This is a fantastic deal for frequent travelers....just have a $5 top-up to keep the number active and then receive unlimited calls and texts while traveling. I have never seen anything like this. Trufone has international roaming in many countries at better rates than Lyca in most cases. T-Mobile, AT&T and Page Plus have limited and mostly very expensive roaming. Thank you for ordering your Free Lycamobile SIM. The email was date-stamped 7 hours later than local time, so the message probably came from somewhere in Europe. Tried to order a free sim, the site won't let me edit the street name, who writes websites like this? I Think they are using AT&T, I just ordered a SIM to Montana,(zip 59071) and I know for sure T-Mobile is NOT available here. No sorry LYCAMOBILE uses T-Mobile Network in USA. If the address the website provides for your zip has a PO Box address to select, you get to enter you own address, If your zip does not have any PO Boxes listed, you can't edit or change the street name. In my zipcode only PO boxes where listed. I guess that's why it seemed to work for me. Has anyone figured out what the deal with the unlimited international calling is? If I call China which is in there, but then need to call Cambodia which is not, how do I do that? Cambodia is listed on the home page at 4 cents/min. Simple economics. Unlimited international plans will only include the 50 or so countries that cost the least to call. Yes but why are they listing the more expensive destinations if they are not included? Why be an 'international' MVNO is your world is only 50 countries? Us peoples from everywhere else in the world need to call home too. This is why I like Ultra better. The Lyca site has a lot of problems. I think it's trying to say that unlimited calls to the 50 countries are available on the monthly plans during the promotional period (which one page says ends Mar. 31 and another page says ends Apr. 30). Presumably the other countries that have a price listed can be called but you have to pay extra. Do they allow roaming here in the U.S. (like on AT&T and other regional GSM networks)? They mention it in their TOS. Just got off the phone with Lycamobile customer service, they currently do not have roaming here in the U.S. but are working on getting it. What are you throttled too after the initial 4G? 3G or 128kbps? If it's 3G, I may jump on board. $39 is a great price. Probably 128 Kbps which is typical of T-Mobile MVNOs though Simple Mobile's throttled speed is 256 Kbs so it might be that high. Do MNOs make money on incoming calls from other networks? Something like that would be required for Lyca to offer free Incoming calls and not be charged for them by T-Mobile. Otherwise, Lyca will have to monitor your payGo usage and cutoff excessive incoming call users. Yes they are called termination fees en.wikipedia.org/wiki/Termination_rates details. I'm haven't seen anything indicating that Lyca offers free incoming calls in the US on pay as you go, only when roaming internationally. I am one of the last iden users of sprint/nextel/boost/nextel. Which sprint is shutting down at the end of June. I have a t-mobile pay as you go line. And another unlimited all messaging with t-mobile monthy 4g plan. So I was thinking about moving the iden line to airvoice's 10 dollar monthly plan which has the same minute and text rates as lyca. Which for airvoice came to 250 minutes or 500 messages. Seeing as I already have unlimited monthly all messaging plan from t-mobile I was going to use this airvoice plan just for the 250 minutes. Internet is not a big deal for me since at my university they have wifi and at home I have at&t wifi. After reading this however this is way better. This is a pay as you go plan instead of me paying 10 bucks monthly to airvoice. Another plus most companies for pay as you go make you pay a minimum of 10 every 90 days where this is only 5. Airvoice and lyca pay as you go have same minute and text rates but the difference is airvoice charges 33cents a mb where this only charges 6cents a mb. I've decide I will see what free phone boost offers me to switch from iden to cdma. I will take it, use up my rollover pay as you go minutes I have left, then port number to lyca, and lastly sell that free phone they gave me on CRAIGSLIST for a profit lol. Like I said I already have two t-mobile lines a 3g and 4g phone so obviously with these low data rates I would be able to use data some time when I am not at college or at home. I hope third party retailers pick up on lyca. You know like the little neighborhood corner type stores by fiesta that offer like pageplus and airvoice. I prefer paying cash and we might even see this in walmart, which has started selling telecel in stores. I am in Houston and they test trialed GSM go smart mobile (t-mobile mvno) before it even went nationally last month; so hopefully they will get lyca also. For pay as you go this is a no brainer people. And most people prefer GSM over CDMA because all you have to do is swap sims in different phones. If lyca is true to their word as someone previously commented, and they get free US roaming; they will definitely steal a lot of pay as you go/ light cellular users from all companies. Does Lyca charge maintenance fee for pay as you go? Just wondering if Lycamobile's csr verified that the "Minimum top-up is $5 good for 90 days." Lycamobile's website does not exactly make this clear. This would be a great deal for paygo users if it does happen. On the other hand, count me in as one who is waiting for paygo to be at least available for purchase before I believe it. The CSR deflected all questions about pay as you go by saying that it wasn't available yet. The TOS indicates a 90 day validity. Of course, that could change when pay as you go is actually available. Cant order Sim, zip code 90503 (California) shows invalid, tried other zip codes in Southen California and the same thing, I guess their service is not available in California. My zipcode doesn't work anymore either so I called them and they are sending me a SIM. I'm in San Francisco. I think that the international roaming rates have to be in error. They show free incoming calls in every country that I throw at it - including Cuba which has very high incoming rates with every other carrier. In parts of the world where incoming calls are free, there is a surcharge to call mobile phones - and even then, free roaming of any sort is unusual. Indeed, Lycamobile carriers in Europe do not give free roaming. It does not make any sense that Lycamobile US will deliver calls to its customers roaming in any country in the world for no charge. No other carrier in the world does this. Anyone know if lycamobile 4 cents / text includes MMS? Is MMS supported? As far as I can tell MMS is not supported. Their web site doesn't mention MMS at all and the data setup instructions say to leave the MMSC field blank which seems unlikely to work. I expect to get a SIM this week and will see if I can get MMS working. 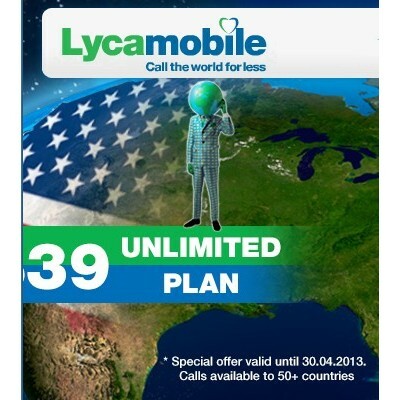 as of 4/16/2013, as per Lycamobile's customers' service, MMS is not supported. But is being worked on to be able to do so soon. How soon is "soon"? impossible to say. With a Lycamobile US SIM incoming calls are four cents per minute. I am paying 2c/minute with my Lycamobile US SIM. You're right , calls were 4¢/min when Lyca launched but they reduced it to 2¢ in March. Use the prefix and country code for US like you would for any international call. 001 followed by the 10 digit US phone number. If the call goes to the correct users voicemail it means they aren't answering or are in an area with no service. today lycaamobile charged me 2cents/min for an incoming international call!!! !was that an incident or really they have this charge? That sounds normal to me. Calls have been 2¢/minute since March. Incoming international calls are charged the same as domestic by all US operators. I found that I have to choose any plan like 16$or 30$ to use Paygo. There is no way I can use Paygo directly without choosing any plan like 16$. And is it happen to everyone? If you mean on the SIM ordering page, you don't have to select a plan. Just select any amount in the "Need Pay-As-You-Go Recharge?" dropdown, leave the plan dropdown unselected and click the "Checkout" button. Ping and upload are still slow. If you have good signal strength, you need a new phone. Customer Service is not trained that Lyca does not support iMessages (2 reps I spoke with). Tech Support knows that Lyca does not support iMessages. CS will offer to turn off all SMS for you. That did not work for me; they could not do it. Solution: You will have to turn off iMessages in settings, and cancel all iPhone popups that alert you that iMessages is trying to activate. If you click OK, you will be charged $.12 per attempt. Even with iMessages turned off, you will be able to send regular SMS on Lyca. Lycamobile supports international SMS so I wonder why iMessage activation fails? Have you asked for help from Apple? Dennis: I will ask Apple for help, since I have tel tech support. The activation messages sent by my iPhone just fail to activate it (the data service vs regular sms). When I send SMS, the text background is green, not blue and I am charged. The Lyca tech rep told me they do not support iMessages, but did not explain why. First he tried to blame Tmobile, but I told him it works fine on Ptel and on Truphone, which is also UK-based. Maybe they do not want to lose the SMS revenue. I will switch the SIM to another iPhone that has iMessages active with Tru to see whether that makes a difference. Truphone has no problem with iMessages. I switched the Lycamobile SIM to the other iPhone, and this forced me to set up iMessages again. This time after I logged in with my Apple ID and clicked OK to the carrier activation message charge warning, iMessages activated. The process worked the same on the iPhone setting up iMessages with the Truphone SIM. Perhaps my iMessage settings were corrupted with Lycamobile and iMessages on the other iPhone. What are you folks paying as your taxes, fees and surcharge with your monthly plan? Meaning for example: $29/month + how much in taxes and fees? There are no taxes or fees if you buy airtime directly from Lycamobile. Thanks for the reply. I had a small chat with their service rep and found the same info. But ultimately it was disappointing to find out that it is 2G data speeds on $29 plan. So that's wayyy too much to pay for 2G. Otherwise I would've gone for a moto G and lyca sim as lyca is probably a little more stable in service than republic wireless.